I only translate German/English into French. For large orders – more than 2000 words, please contact me before ordering. I will translate any kind of text from German or English into perfect French. 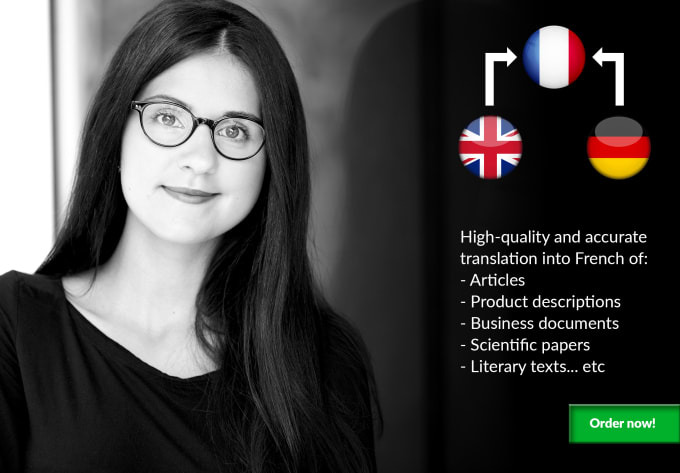 French is my native language and I completed my studies in German and French Linguistics in France and in Germany, where I have been intensively trained in translation. I have been working in translation for 4 years for different companies or institutions such as the Goethe-Institut. I studied in the selective literary preparatory classes for the Grandes Écoles in France (Hypokhâgne) where I learned to write in a perfect French and to translate from German and English into French. During my studies, I learned to translate with accuracy and style, and I am still working according to these principles. I am determined to deliver the best work possible. That is why I have decided to translate exclusively into French, my mother tongue. My aim is to satisfy my customers with my high-quality translation services and up until now, this has always been the case. For large orders – more than 2000 words, please contact me before ordering. :Wie immer hervorragend, schnell und tolle Arbeit! Dankeschön! :Ganz tolle Arbeit! Hier folgen noch viele Aufträge! :Vielen lieben Dank für die netten Worte, ich freue mich auf weitere Aufträge! :Easy to work with, great job. I will translate from English to Indonesian up to 1000 words/gig. I will translate 2500 words from english to italian.